While she was the pastry chef at The French Laundry, Claire Clark wrote Indulge in 2007; now released in paperback, the book remains a must-have. Although it isn’t aimed at complete novices, new bakers will find its calm instructions to be just enough—and just reassuring enough—to make baking beautiful desserts enjoyable. This is a book for grown-ups: It doesn’t shout at you, doesn’t get cutesy, has gorgeous but not precious photos, and tells you what you need to know without babbling on for pages. Most of the chapters, including cakes, pastry, meringues, custards, mousses, puddings, and petits fours, open with a “secrets of success” page that explains, succinctly, the basic rules that make baking fun. Clark also avoids the temptation to lecture about proper ingredients; she does point out in the easily overlooked introduction that because baking focuses on a few core ingredients, bakers should use the best. But that’s it. No tiresome fawning over organic/free-range/free-trade/pesticide-free eggs/chocolate/coffee. Just use the best you can; don’t worry if your results don’t perfectly match the photos; enjoy yourself; and indulge. The one obstacle of the book for beginner bakers, or those who view this as a sometime hobby, is its listing of ingredients by metric and Imperial measures but not cups. If you don’t own a scale, you’re out of luck. But measuring by weight is part of what makes Clark’s quiet assurance possible in these recipes, because it guarantees consistency; an inexpensive scale will quickly prove its worth. 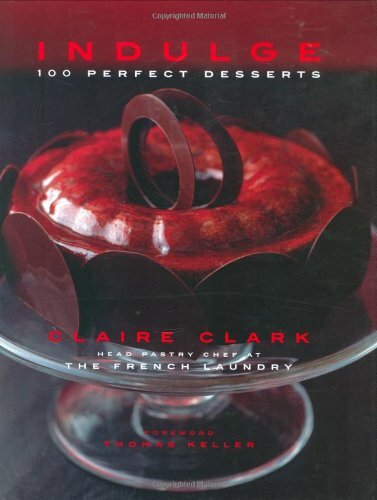 Although many of the recipes here are standards (éclairs, pavlova, panna cotta, tarte tatin, crème brulée, French macaroons), experienced bakers will still want to give Clark’s clear instructions for them a try, before moving on to popcorn sherbet, hibiscus jellies, green tea and jasmine delice, or a spongecake version of lemon meringue pie. Now-trendy macaroons, for example, spur many writers to give great detail about how to get them just right. Clark simply provides a straightforward explanation of each step, with just enough tips and details to inspire confidence (leave the oven door very slightly open to let steam escape; run a little cold water between the parchment and the tray after baking to make them easier to remove). Notes at the end of most recipes offer alternatives to experiment with and further tips for success. Many of Clark’s simple recipes still offer professional tips for finishing touches, such as blowtorching the top of lemon posset to create a perfectly smooth surface, or using a tea strainer to dust shortbread with sugar for an even finish. One of the simplest recipes in the book, Clark’s shortbread, doesn’t fiddle around with cornstarch, rice flour, or other ingredients intended to adjust the texture. Flour, caster sugar (superfine sugar, which can be hard to find but reasonably replicated by whizzing granulated sugar in a food processor), butter, and a vanilla bean will do it. This is one case where using the best butter you can afford will make a difference, but the cookies are worth making even with a supermarket version. Chocolate Red Wine Cake, while delicious, doesn’t quite live up to its name. Bakers tempted to skip the garnish of tempered chocolate discs will want to serve the cake with a chocolate sauce instead; with just 1 teaspoon cocoa powder and 2 ¼ ounces dark chocolate, the cake tastes almost solely of wine and its finishing glaze of redcurrant jelly. A headnote suggestion to make the cake as individual servings with raspberry sorbet and hot chocolate sauce would balance the cake well. Throughout the book, the photos will tempt bakers to replicate the results, and only rarely does a photo not precisely match the instructions (a recipe for cheesecake, for example, offers no instructions for making the chocolate garnish pictured). The meringue heart is one such recipe; meringue bases filled with cream and berries are common, but the beauty of the swirled heart makes this one—like so many in this book—stand out.